Different truffles require different climates and soils. The French black truffle (Tuber melanosporum), the truffle species most widely and successfully cultivated, needs a climate without extreme summer heat or extreme winter cold. The truffles begin to form in the soil during the summer when they are vulnerable to damage from high soil temperatures and dry conditions. The truffles mature between December and the end of February when they can be damaged if the soil freezes around them. These climatic requirements limit the areas where truffles from southern Europe can be grown in North America to southern parts of the Midwest, northern parts of the Southeast, parts of the Mid Atlantic States and a long strip along the West Coast in California, Oregon and Washington. Other areas may be suitable, including parts of Texas, Oklahoma, Idaho, and Southwest British Columbia. If your area is not mentioned, but you feel that it has a relatively mild climate, please contact us. We can look up climate data from your region. In areas with marginally acceptable climates measures can be taken to mitigate microclimatic conditions, including mulching, increasing or decreasing plantation density, choice of site aspect and irrigation. Truffles require well drained soils. Apart from excellent drainage, French black truffles tolerate a broad range of soils from sandy to clay loams, including rocky soils. Successful farms exist on marginal as well as good soils. Soils should be tested and corrected for serious nutrient deficiencies and imbalances prior to planting. We will work with you to determine what soil amendments are needed, if any. 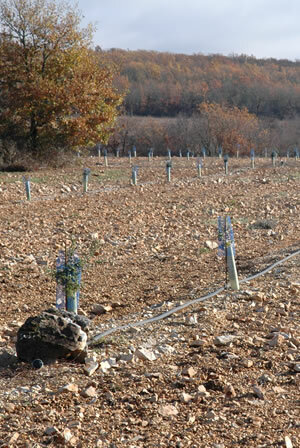 The natural habitat for French black truffles is on sunny slopes and plateaus, often with a south or west aspect, but many successful truffle orchards are on flat ground and/or other aspects. It is usually necessary to drive on the site to apply lime, till or mow so it should not be too steep. Finally, the site must not have had ectomycorrhizal trees on it for at least a few years before planting the truffle trees. Ectomycorrhizal trees include many conifers, oaks and other nut trees, and some shrubs, particularly manzanita. Most fruit trees, maples and other ornamentals are not ectomycorrhizal and do not present a problem. Please feel free to ask us whether particular tree or shrub species on your land will interfere with truffle farming. It is also essential to provide a buffer strip wide enough that the roots will never make contact with nearby ectomycorrhizal trees. Ectomycorrhizal trees that are cleared from the site or are adjacent to the site may support fungi that are capable of competing with the truffles.